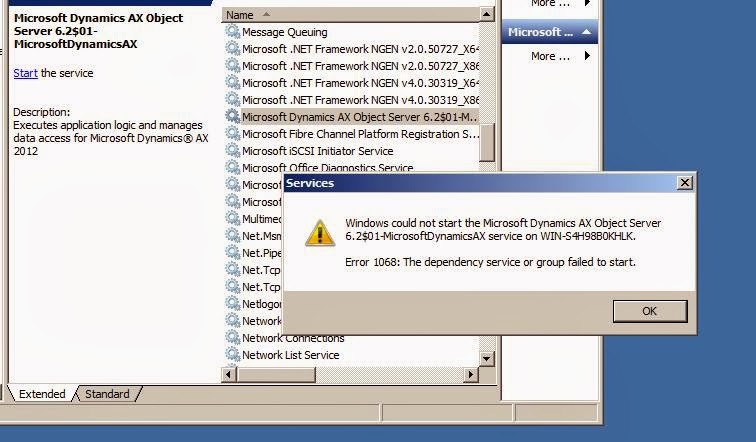 If you are getting error on starting Ax 2012 Server and Error code is Error 1068: The dependency service or group failed to start in Ax 2012. 1. Your Dependencies from Properties..Its RPC and Mssql server just check if other services are activated or not. 2. Right click on (MSSQLSERVER) services go to log on tab enter your new password then start (MSSQLSERVER) services then try starting your AX. It might work. 3,"Error 1068: The dependency service or group failed to start." The error says that there are some dependent services which need to be started before starting this service. Right click on the Dynamics Service and Properties - where you can see the dependencies. For Dynamics service the dependencies are - Remote Procedure Call and SQL server services.Check whether the status of the dependent services. 4.Did you change your machine password If yes then change all the password in services for dynamics ax as well as sql server then Check whether SQL Server Sevices Started or not.